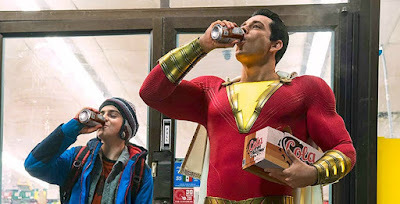 Perhaps no film signifies the new, lighter direction of the DCEU better than Shazam! And that new, fan-friendly direction was fully on display during today's Warner Bros. panel, which included the debut trailer for Shazam! Zachary Levi stars as the titular hero, who emerges mystically every time young Billy Batson (Asher Angel) shouts Shazam!! So this is really the story of a boy who gets to relive the dream so many of us had as kids, to be an all-powerful superhero! The awe and imagination are there in every image, the colors are brighter, Shazam's costume is a blazing heroic red with big, cheesy muscles. It's just a fun looking movie and I'm glad there are rumblings about him becoming a bigger part of the DCEU. Directed by David F. Sandberg, Shazam! opens April 5th 2019 and co-stars Jack Dylan Grazer, Mark Strong, Djimon Hounsou, Grace Fulton, and Ian Chen.